Another project must mean it’s time for a new graphic! Our graphic tells an important story as well, from the top left, we first have Woodrow Wilson’s delivery of the Fourteen Points, then the announcement of the end of the war; Germany signing the Treaty of Versailles, and that famous portrait of the Big Four at Versailles, before four became three. Over four years after we examined the outbreak of the First World War, we now return to the era to examine how, a century ago, it ended. The Treaty of Versailles is infamous in the historical canon for several reasons; it was the platform of resentment which enabled Adolf Hitler to shine; it was the naive vengeance project of paranoid French statesmen; it was the equally naive but well meaning dream of a philanthropic American President, who found a world not yet ready for his ideals or for the League of Nations which these ideals spawned. The Treaty of Versailles is many things, but for the next eight months - from 11 November 2018 to 28 June 2019, it is our story, our narrative, our mission, our project, our world. It is our task to investigate several pressing questions which many understandably have about it: was it as bad as everyone thinks? Was there any other way around it? Did it stand a chance? People, themes, crises, controversies, triumphs, theories, great men and bad men and mediocre men all rolled in together - we will cover it all. 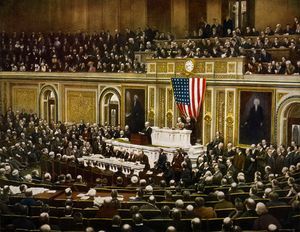 The United States entered the First World War in April 1917. A major part of our task is to examine the foreign policy of President Woodrow Wilson, and explain how that man came to dominate ideas of a post-war settlement. Our narrative takes a German-centric approach, with Germany and the Treaty of Versailles serving as our protagonists, to be joined by the allies, specifically the US, the British and the French. Only by placing these actors in their proper context, by appreciating the strengths and weaknesses of these men for what they were, and by getting to grips with what they did and why, can the Treaty of Versailles and the ludicrously eventful Paris Peace Conference which housed it loom into the view and out of the fog of history. It is my pleasure to welcome you on this journey, a journey we began all the way back in summer 2014 when we asked how the war happened; now we ask, how did it all end? The project is so large that splitting it into three sections has been necessary. As new sections are completed, episodes pertaining to that section will be uploaded here. Make sure as always to check out the podcast feed for the latest episodes. Since this remains a work in progress, the Bibliography is still being expanded upon. Once the ground work is done, a mind-bendingly large bibliography will be uploaded here and in the source materials section of the site for the convenience of history nerds everywhere! Introduction episodes 1-3, outlining the concept of the project, its structure and what is different about my take from other accounts. Part 1 is a complete overview of our aims and approach; Part 2 focuses more on the structure; Part 3 assesses the origins of the war with the use of our arguments from the July Crisis Project inserted in for the sake of context. Why, we ask, does it not matter that the Germans did not necessarily start the war all by themselves? Do they still deserve the Treaty of Versailles anyway, or not? Join me and find out!